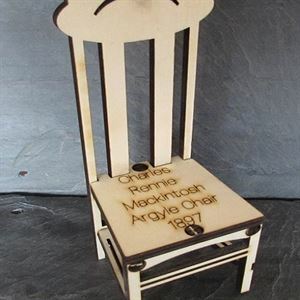 This is the Iconic Argyle chair designed by Charles Rennie Mackintosh in a larger model form with 6mm Poplar Plywood. The chair is 16.5 cm high by 6.5cm x 7cm. Precision laser cut in 6mm Italian Poplar. Pop Up cards are quick to make, easy to assemble, need no glue and all have pop out parts to make them 3D. Pop Up cards are designed and made in Scotland by precision laser cutting. The are made from a sustainable and recyclable poplar plywood. All A5 cards come with a C5 cellophane wrap and a paper insert with a space to write a message! Wooden cards are L210 x W140 x T6 mms and weigh about 80gms.